As sound comes from such a large area, it is often a good idea to use a couple of different miking techniques to record a marimba. Placing mics at either end, but still fairly far from the instrument, and below the level of the bars will pick up the resonators (the metal tubes), but will not be too harsh. Alternatively, placing a stereo pair above the head of the player will capture the sound from his or her perspective, though the results could lack resonance. I have a question about recording percussion — in particular, tuned percussion. Why is it that some sound engineers can record without a massive impact when a mallet strikes a bar, and others can't? Miking marimbas seems to be the hardest job, I guess because of its size, and some use two mics, while others one. What is the best approach? 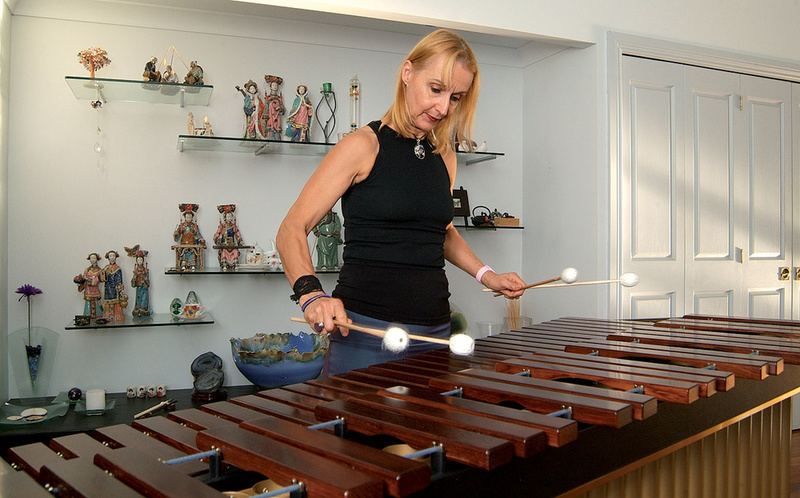 SOS contributor Jon Burton replies: The general consensus seems to be that marimbas, in particular, are one of the hardest percussion instruments to mic up. For anyone who hasn't seen a full-sized marimba up close, they are very large, at about 2.5 metres long! They also produce sound from several points. Beneath each bar is a resonator, and it is the combined sound of these that makes up the wonderfully rich tones. The range of notes produced can also be anywhere between 3.5 and 5.5 octaves. Choice of mallets can also greatly affect the tones produced, with soft mallets producing warmer tones and harder mallets producing far more attack. When recording it is very easy to over-emphasise the sound of the mallet striking the bar, which produces a harsh sound. It is therefore important to try to capture the instrument as a whole, including the resonators. Engineers have different views on what to use, with suggestions varying from single to multiple microphones. As for placement, there is less variation, with engineers generally plumping for one of two options. The first would be to have a microphone either end of the marimba between four and eight feet away, depending on the room you are recording in and how much room you want to capture. 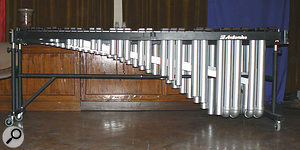 Placement below the level of the bars will increase the amount of sound from the resonators. Raising the mics up will increase the sound from the bars. At this point you can decide what balance suits the track best. The other method is one I have always preferred, which is to put a stereo pair above the head of the player and capture the sound from his perspective. This can sometimes lack resonance but, if combined with the first technique, can give you lots of options. As for microphone choice, I would go for dynamics for the resonator mics: a pair of Electro-Voice RE20s works well but, equally, you can use Shure SM57s. And for the overhead mics I'd use the best capacitor microphones you have! In these days of almost unlimited track counts, recording these as two stereo pairs will give you the chance both to balance both the stereo image and the relative contributions of the bars and the resonators.